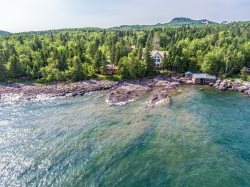 Lake Superior is the cleanest and clearest of the Great Lakes thanks to low amounts of nutrients, sediments, and organic material. Even so, it is still impacted by pollution. Because the lake’s shores are not as developed with cities and industries as the other Great Lakes, it has never suffered from pollution in ways many other lakes do. This lets the wildlife that call Lake Superior home flourish and enjoy a healthy life.